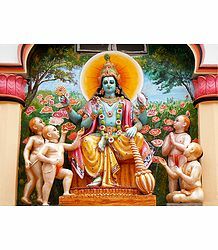 Hindu mythology is full of colorful, flavorful stories about Devas (Gods) and Asuras (Demons); narrating the varied relationships they shared; the devotion of certain Asuras toward their Ishtadevatas (favorite deities); some Asuras' struggle against the Gods and so on. Each of these tales is so woven as to educate the reader or follower about some aspect of life and living. Interestingly, even curses hurled upon them have a certain function to perform; eventually leading to the general good of the world. In this month's article, we bring you the stories of Hiranyakashipu, Ravana and Dantavakra. The common aspect between these three terrible demons was that they were actually the three reincarnations of Jaya and Vijaya, who were the Dwarapalas of Lord Vishnu at heavenly abode, Vaikuntha. We now bring you the individual legends of these Asuras; then narrating how their curse worked to liberate them from the mortal plane itself. 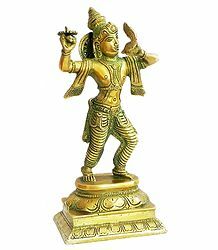 Hiranyakashipu, literally meaning, the one 'clothed in gold', was a terrible Asura, featuring in the Puranic scriptures. He was the king of the Matsya kingdom. 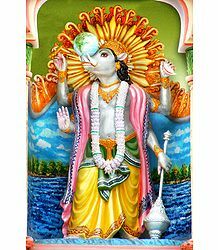 His younger brother, Hiranyaksha, was killed by Varaha, the third avatara of Vishnu. This turned the demon against the Lord. According to the Bhagavata Purana, Hiranyakashipu and his younger brother, Hiranyaksha, were actually reincarnations of Jaya and Vijaya, the gatekeepers of Vishnu. They were sent down to Earth due to a curse from the Four Kumaras. The birthplace of Hiranyakashipu was Moolsthan, supposedly the present-day Multan. These two brothers were called the Hiranyas. Both were born to Diti, the daughter of Daksha, and Rishi Kashyapa. 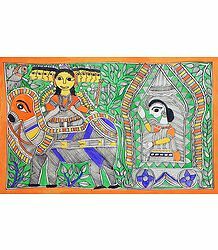 They were said to be born as Asuras, as they were conceived at the time of dusk, which is believed to be an inauspicious time for conjugal union. 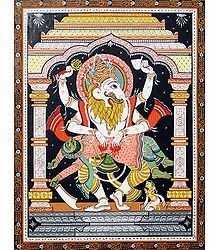 After Varaha had killed Hiranyaksha, Hiranyakashipu swore revenge and decided that he would, in turn, destroy Vishnu. He decided to undertake penance to earn the grace of Lord Brahma. The latter, pleased with his austerities, appeared before him and told him to ask for a boon. When Hiranyakashipu demanded immortality, though, Brahma refused, saying that anything that was born on Earth had to die someday. So he told him to ask for another boon. He further asked that he would have no competitor or rival and that he should have sole lordship over all living entities and presiding deities. He also wanted mystical powers, which could normally be attained only by undertaking severe austerities. Brahma granted him all of the above, blessed Hiranyakashipu and left. This newly found power made the Asura drunk with his power. He decided that it was time he showed off his powers and established his superior status, even as compared to the Devas. When Hiranyakashipu was in penance, Indra and the other Devas decided to attack his home. At that point, sage Narada intervened to protect Kayadhu, the devout and pure-hearted wife of the demon. He took her under his wing, until the time Prahlada, the child she was carrying, was born. Right from the womb, Prahlada would hear Narada sing praises of Lord Vishnu. Thus, he became a great bhakta (devotee) of Vishnu. Hiranyakashipu resented his son's leaning and extreme devotion toward Vishnu. When things became unbearable for him, he decided to kill Prahlada. However, he failed each time he tried to kill the boy. The asura even summoned his sister, Holika, to assist him in killing Prahlada. Holika had a gift – she could never be burnt by fire. He asked his sister to seat Prahlada on her lap, in a burning pyre, so that the boy would die in it. The boy started chanting Vishnu's name and lo! Holika was burnt to ashes, but Prahlada came out of the fire, completely unharmed. The burning of Holika is celebrated the night before Holi, the Hindu Festival of Colors. Prahlada refused to acknowledge his father as the supreme power and would instead keep praying to Vishnu, who he considered the all-pervading Supreme Being. One day, Hiranyakashipu led his son to a pillar in the palace and asked him if Vishnu would be residing in there. Prahlada answered in the affirmative and said that his Lord resided everywhere – in every pillar; in every twig; in everything living and otherwise. This further incensed the Asura. In a fit of rage, he lifted his mace and banged it hard against the pillar. The pillar shattered and from inside it, jumped out Narasimha, a fearsome entity who was half-man and half-lion. This was actually the 4th avatar of Lord Sri Maha Vishnu. He had manifested to destroy the arrogant asura and also to protect his young devotee, Prahlada. Narasimha then proceeded to attack Hiranyakashipu. As per the asura's conditions for death, Narasimha was neither a human nor a Deva nor an animal. He manifested at twilight (a time which was neither day nor night); on the threshold of the courtyard (this was neither inside nor outside the palace). He put the asura across his thighs (this was neither on the ground nor in the sky) and, using his sharp claws (not weapons of any kind), he tore the demon open, disemboweling him; killing him instantly. After slaying Hiranyakashipu thus, Narasimha was still in a terrible, furious state. No God or demi-God, not even Shiva, could calm him down. The Devas then requested the Lord's consort, Devi Lakshmi, to appear before him and soothe him with her presence. However, she too failed in this task. Finally, Brahma asked Prahlada to present himself before Narasimha. The minute the Lord saw his young devotee, he calmed down and smiled benevolently upon him. Taking care not to frighten young Prahlada, Narasimha immediately took the form of a child about the boy's age and smilingly blessed him. The Bala (child) was called Narasimha Perumthrikkovil. One of the most famous temples at Ramamangalam, Eranakulam district, Kerala is dedicated to the worship of this lovable form of Sri Vishnu. Ravana, the main antagonist in the epic Ramayana, was the Demon King of Lanka. 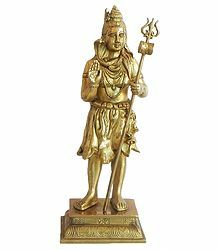 He is often described as a handsome, very wise and scholarly man; a capable ruler; having 10 heads (actually indicating his extensive knowledge of the 4 Vedas and the 6 Shastras); also a great devotee of Lord Shiva. 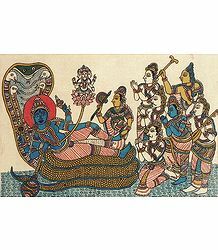 In the Ramayana, Ravana fell in love with Devi Sita, Rama's wife, and kidnaps her in a bid to try and make her his own. 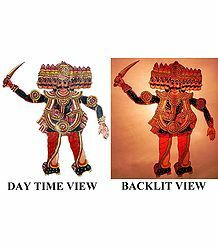 Ravana has many other names, including Dashaanana, Dashamukha, Ravula, Lankeshwar, Ravaneshwaran, Dasis Ravana, Dasis Sakvithi Maha Ravana and so on. Apart from India, Ravana prominently features in the literature of several other countries in the Asian subcontinent, including Burma, Indonesia, Malaysia, Nepal, Thailand and, most importantly, Sri Lanka. Sometimes, Ravana is depicted as having 9 nine heads; having sacrificed one head to his Ishtadevata, Shiva. He is also described as having been a maestro of the Veena, the National Musical Instrument of India. Besides this, Ravana also possessed vast knowledge of political science and Ayurveda. He is also believed to possess the Nectar of Immortality, stored within his belly – this was a boon bestowed upon him by Lord Brahma. Ravana was the son of the Rishi (Brahmin) Vishrava and a Rakshasi (demoness) princess, Kaikesi. Thus, he attained the status of a Brahmarakshasa at birth. This also made him both a Brahmin and a Kshatriya (warrior) at the same time. He was thus an Agnihotri and also a great follower of Sage Valmiki. Sage Pulastya, one of the 10 Prajapatis or the mind-sons of Brahma, also one of the Saptarishis (Seven Great Sages); was his grandfather. Later during his life, Ravana usurped Lanka from his half-brother, Kubera. Thus, he became the King of Lanka and continued to follow Kshatriya Dharma ever since. Ravana's other brothers were Vibhishana, Kumbhakarna, Khara, Dushana and Ahiravana. He also had two sisters, Kumbhini and Shoorpanakha. Shoorpanakha was his favorite sibling – he loved her dearly. Even as a youngster, Ravana was always rather aggressive and arrogant. However, he was undoubtedly a great scholar – he mastered the Vedas, other holy scriptures, the arts and the martial arts under the able tutelage of his father, Vishrava. He was passionate about the Veena. In fact, his flag had the image of the Veena on it. Ravana was always undertaking some penance or the other to please Shiva. However, his innate arrogance once got him into trouble with the Lord. When he first visited the Lord's abode at Kailas, his vahana (vehicle) Nandi blocked the asura's way and refused to let him enter. Annoyed, Ravana started teasing Nandi, due to which the latter cursed him that his kingdom would be destroyed by a monkey. The demon king then proceeded to show off his power to Nandi. He uprooted Kailas on a whim. Shiva was angered by this and decided to teach his devotee a lesson. He pressed his little toe on Kailas, causing the mountain to pin down Ravana under it. Understanding his folly, Ravana decided to appease Shiva and calm down his anger. Legend has it that Ravana pulled out his own nerves with his bare hands, would them around his toes and used them as strings to play music. He used his own body as a Veena and sung praises of the Lord. Several months later, Shiva relented and, pleased with his devotion, gave him the Chandrahas, a divine sword; warning him that if it were to be used unjustly, it would return as the three-eyed one and destroy him. Ravana, in turn, became one of the greatest ever devotees of Shiva and composed several songs on the Lord, including the Shiva Tandava Stotra. Ravana again underwent severe penance and austerities, for several years, in order to attain the grace of Shiva. During the course of this penance, he chopped off each one of his heads as a sacrifice to his Lord. By Shiva's grace, each time he sliced off one of his heads, a new head would grow back in its place. Shiva finally appeared before him and told Ravana to ask for a boon. He refused when the latter asked for immortality. However, he blessed him with the Nectar of Immortality and promised him that nobody would be able to destroy him as long as it lasted within his belly. Shiva also granted him additional knowledge of magic and expertise in using divine weapons. Taking this as an indication of total and indestructible power over the entire Universe, Ravana got very arrogant. He first usurped Lanka and made it his own capital. Kubera would have been happy to share the city with him. However, Ravana wanted it all and threatened Kubera that he would take it by force if he had to. He then asked the celestial architect, Vishwakarma, to change it into a beautiful, idyllic city. Accordingly, the entire place was built in gold. His arrogance notwithstanding, Ravana was a capable ruler. The kingdom flourished under his rule and all its citizens were very happy. Even the so-called poor houses had enough gold for their sustenance and no one ever went hungry or bankrupt. He continued to wage war against all other rulers, conquering other kingdoms, ruling over humans and celestial beings as well. He also conquered Patala (the Netherworld) and passed over the reins to Ahiravana. With time, he became the supreme ruler – the Emperor of the Three Worlds. So strong was he that he even commanded the sun to rise and set as he wished. Ravana married the lovely Queen Mandodari, the daughter of celestial architect, Maya. He had three wives and seven sons in total. Out of them, Meghnad (also called Indrajit) was his favorite son. He was the most powerful of his sons and also heir to his throne. Ravana had always lusted after Sita and had a desire to make her his wife. But Sita always had eyes only for Rama. Ravana felt humiliated when he failed to win Sita's hand at her Swayamvara ceremony. He been unable to lift and string Shiva's bow, while the young Rama had effortlessly managed it in one attempt. He swore then that he would make Sita his own, one day. When Rama, Lakshmana and Sita were staying in the forest, Ravana's sister Shoorpanakha fell in love with Rama. She approached him and proposed marriage to him. Rama refused, saying that he was married and in love with his wife, Sita. She then approached Lakshmana, who flew into a fit of rage and chopped off her nose. This further incensed Ravana and he decided he would teach them a lesson. He asked his uncle, Mareecha, to disguise himself as a golden deer and attract Sita's attention. On seeing the attractive deer, Sita pleaded Rama to go after it and capture it. Rama reluctantly left her in Lakshmana's care. Going deeper into the forest, Mareecha let out a scream in Rama's voice. Hearing this, Lakshmana decided to go after his brother, after sketching a Lakshman Rekha (a line on the ground) with his arrow, asking Sita not to cross it till they got back home. Once he left in search of Rama, Ravana disguised himself as a mendicant and approached Sita for alms. He stood at a good distance from the Lakshman Rekha, thereby forcing Sita to cross over it. Once she came close enough, he lifted the entire piece of land she was standing on, placed it on his Pushpaka Vimana (flying chariot) and whisked her away to Lanka. Ravana kept her captive in Lanka for nearly a year. Though he kept asking her to marry him, he never once touched her. It is believed that no one could ever touch Sita, unless she permitted them to do so. During the time when she was held thus in Ashokavana, Rama met Hanuman and asked him to find and rescue Sita. Hanuman traced her whereabouts, met her and took her blessings. He then burnt Lanka down when Ravana's army tried to capture him. Once he came back to Rama, the entire Vanarasena (army of monkeys) then built a bridge to Lanka and Rama waged war against Ravana. Rama was aware of his special powers and so, acquires advanced weapons for the impending war. Lakshmana was greviously injured during battle. Hanuman immediately left to procure the Sanjeevani herb from the Himalayas – this helped save his life. The battle went on for long. Vibhishana, in the meantime, informed Rama about the Nectar of Immortality that his brother held in his navel. Rama realized that he must drain out that nectar if he had to kill Ravana. The next day in the battlefield, he aimed at the exact spot and sent an arrow to attack Ravana. The lethal arrow found its mark and the powerful asura king breathed his last at the hands of Lord Rama, thereby instantly attaining Moksha (liberation). On the day of Dusshera, Ravana's effigy is burnt to commemorate the victory of good over evil. On the other hand, there are also people who are devoted to him for his devotion to Shiva; his wisdom and strength. There are many temples dedicated to the worship of Ravana as well. According to the epic Mahabharata and the Puranas, Dantavakra was the ruler of Karusha. The Vishnu Purana states that he was the son of Vriddhasharman and Shrutadeva. An ally of Jarasandha, he was the brother-in-law of Shishupala, who considered Vasudeva Krishna as his sworn rival. Naturally, Dantavakra was also very much against Krishna and the Pandavas in general. Before we get into the story of Dantavakra, let us talk about Shishupala's life. Shishupala was the ruler of Chedi. He was the son of King Damghosh. His mother, Shrutshravana, was the sister of Vasudeva, Krishna's father. That made him Krishna's cousin. He was severely disfigured by birth; so much so, that his parents thought of abandoning him. However, an akashvani (celestial voice) stopped them from doing so, saying that this child would one day, become very powerful. It also stated that a man, on whose lap the child would be placed, would permanently cure his disfigurement. However, the voice also warned them that the very man would ultimately slay the child. Over the next few months, the child was placed in the lap of several people hailing from all walks of life. But no change came about. One day, Krishna, along with Balarama, came visiting the palace. The moment Krishna picked up the child, his additional limbs and third eye disappeared and he started looking like a normal, happy child. While this was a source of joy to his parents, they also realized that Krishna would be the one to eventually kill him in the future. Krishna's aunt was alarmed that her own nephew would one day kill her son. She begged Krishna to show mercy on them. Krishna replied that he would not be able to change the course of destiny, but promised her that he would forgive a hundred offences of Shishupala, before allowing the prophecy to come true. With time, Shishupala emerged a strong leader and a powerful king. He was also an ally of Jarashandha and hence, disliked his cousin Krishna. Dantavakra was so named because he was born with jagged, protruding teeth. His mother, Pruthudevi, was the sister of Vasudeva, Krishna's father. She was not at all happy to see this deformity in her child. However, she hoped that this would be rectified in course of time. Dantavakra and Shishupala, apart from being family, grew up to become close friends. Both their kingdoms, Chedi and Karusha, were under the sovereignty of Jarasandha, the Emperor of Magadha. The boys hence grew up under the tutelage of Jarasandha. Jarasandha hated Krishna because he could not subjugate him. Jarasandha was eventually killed by the Pandava prince, Bhima, during a wrestling match. This made Dantavakra hate them even more. Soon after, Yudhishthira decided to conduct the famous Rajasooya Yagna. For this, he invited several princes and kings, including Shishupala. Shishupala arrived with great pomp and took his place. Soon, he spotted Krishna among the crowd. He approached Krishna and started hurling loud abuses at him, hoping that all the others present would join him as well. The last ritual of the Yagna was to confer honors upon all present at the ceremony. Before this, the best participant had to be chosen and he had to be honored first. Everyone, with the exception of Shishupala, was in favor of choosing Krishna. He continued to abuse Krishna publicly, in spite of the latter's warning. Finally, he was killed at the hands of Krishna. He hurled his Sudarshana Chakra at him – it followed him as he tried to run from it and finally beheaded him. It was too much for Dantavakra to take in the news of the death of his good friend, at the hands of his sworn enemy. 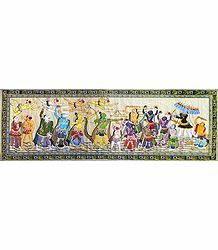 This, plus the death of his best friend Shalva, who was also slain by Krishna, made him go mad with rage – he decided to avenge Shalva's death. Proud and arrogant by nature, he fought with just a mace, without either his armor or chariot. Krishna saw Dantavakra approaching him and promptly dismounted from his own chariot, also picking up his own mace. Warrior etiquette demanded that a fight in the battlefield should be kept fair. The crooked-toothed one pounced on Krishna with intent to kill him. The latter, however, defeated him only too easily. He finally tore open Dantavakra's ribcage with his mace. Stunned by the fatal blow, he staggered, vomiting blood. In the next few moments, he fell to the ground and breathed his last. As Shishupala and Dantavakra fell dead, onlookers noticed balls of light leaving their bodies and merging in the body of Krishna. This meant that they too had attained moksha. The unique aspect about the legends of Hindu mythology is that, no matter how fantastic and impossible they may seem, they all serve a purpose. They are there for a reason – many of these stories come packaged with a hidden lesson as well, that we could all learn from. There was a reason why we brought you the story of these three asuras; Hiranyakashipu, Ravana and Dantavakra. They are linked by one common factor – as mentioned at the start of this post, they are all the three reincarnations of Jaya and Vijaya - the two demigod Dwarapalas (gatekeepers) of Vaikuntha, the abode of Lord Sri Maha Vishnu. According to the Bhagavata Purana, the Four Kumaras, namely, Sanaka, Sanandana, Sanatana and Sanatkumara were manasaputras of Lord Brahma. They once visited Vishnu at Vaikuntha. Though they were quite old chronologically, they looked like small children, due to the power of their tapas (penance). They were embodiments of the purest qualities and completely lacked any negative quality such as anger, pride, greed, attachment, lust or other material desires. 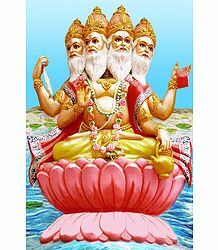 Brahma had originally created the Four Kumaras so that they could assist him in creating the Universe. However, they refused to participate in the process of procreation and, instead, chose to take the path of Brahmacharya (celibacy). They requested their divine father to bestow upon them the boon that they would eternally remain five years old. Thinking that they were a bunch of mischievous children, Vishnu's gatekeepers, Jaya and Vijaya, stopped them from entering the gates of Vaikuntha. They also told them that Vishnu was resting and so, they would not be able to see him at that point of time. Angered by this, the Kumaras retorted that Vishnu is always available to his devotees, at whatever time they call him. They then cursed Jaya and Vijaya that they would have to forfeit their divine status and be born on Earth, in order to wipe off their sins. At that moment, Vishnu appeared before them. Repenting their ignorance and arrogance, Jaya and Vijaya beseeched Vishnu to free them of the curse. The Lord said he could not undo a curse, but could reduce its intensity. He gave them two options they could choose from. The first option was to take seven births on Earth as devotees of Vishnu. The second was to take three births as his enemies. The Lord told them that after serving either of these two sentences, they would be able to come back to Vaikuntha and permanently reclaim their original position as his dwarapalas. Jaya and Vijaya could not even imagine being away from Vishnu for seven whole lives on earth. Hence, they chose to be his enemies for three lives. That way, they thought they would also be able to attain moksha at the hands of their beloved Lord. 1. In their first life, Jaya and Vijaya were born as brothers, Hiranyakashipu and Hiranyaksha, during the Krita Yuga. Hiranyaksha was killed by Varaha, the third avatara of Vishnu, whereas Hiranyakashipu was killed by Narasimha. 2. In their second life, they were born as Ravana and Kumbhakarna. Here too, they were brothers. Ravana was killed during the Treta Yuga by Rama, the seventh avatara of Lord Vishnu, while Kumbhakarna was killed by Lakshmana, Rama's brother, who was also considered an extension of his own divinity. 3. In their third life, they were born as Dantavakra and Shishupala. In some versions, Dantavakra is replaced by Kamsa, the cruel brother of Devaki, Krishna's mother. Krishna is the eighth avatara of Sri Maha Vishnu – he manifested during the Dwapara Yuga and killed Shishupala, Dantavakra and his own uncle, Kamsa. With the slaying of Dantavakra, the prophecy of Jaya-Vijaya had been fulfilled and their curse, broken. Now they were free to return to Vaikuntha and serve their Lord as his dwarapalas for all time to come. Through their journey of three human lives, they had also learnt to give up their arrogance and ego and completely surrender themselves to their Lord. It is worth noting here that, with each subsequent reincarnation, Jaya and Vijaya gradually lost their strength and level of evil. It was most necessary for Vishnu to kill Hiranyaksha and Hiranyakashipu. Later, Vishnu took the Rama avatara because the mighty Ravana had to be felled. Kumbhakarna played only a small role in the entire drama. In the Krishna avatara though, the main focus of the Lord was not to kill Shishupala and Dantavakra (or even Kamsa). He only did so to reduce the burden of Mother Earth; also freeing his dwarapalas of their curse in the process. Now, statues of Jaya-Vijaya stand prominently in the temple of Lord Venkateshwara in Tirumala, the temple of Lord Ranganatha in Srirangam and the temple of Lord Jagannatha in Puri.